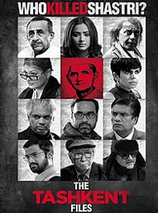 says "The Tashkent Files is a Hindi thriller film about the death of former Indian prime minister Lal Bahadur Shastri, directed by Vivek Agnihotri and it stars Mithun Chakraborty, Naseerudin Shah, Shweta Basu Prasad, Pallavi Joshi, Pankaj Tripathi, Rajesh Sharma, Mandira Bedi, Prakash Belawadi, Vishwa Mohan Badola, Prashantt Gupta, & Vinay Pathak"
to get instant updates about 'The Tashkent Files' on your MyPage. Meet other similar minded people. Its Free! the tashkent files says "The Tashkent Files is a Hindi thriller film about the death of former Indian prime minister Lal Bahadur Shastri, directed by Vivek Agnihotri and it stars Mithun Chakraborty, Naseerudin Shah, Shweta Basu Prasad, Pallavi Joshi, Pankaj Tripathi, Rajesh Sharma, Mandira Bedi, Prakash Belawadi, Vishwa Mohan Badola, Prashantt Gupta, & Vinay Pathak"